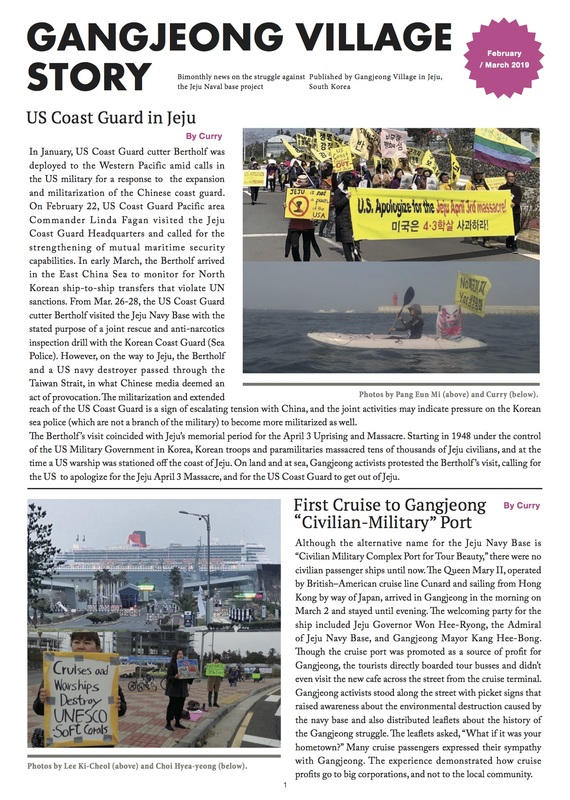 To the people’s indignation, the party has attributed its failure in April 11 general election to its changed position into the critique on the currently enforced naval base project to the dislike by the general South Korean citizens for whom security consciousness is presumed by the party to be important. Such analysis has gotten much criticism from the progressive who analyzed the party’s failure as the Party’s remaining unchanged without true renovations and the Party’s weak efforts to persuade people. The Pan-Island Committee for the Stop of Military Base and for the Realization of Peace Island stated in its refuting statement on Nov. 13. 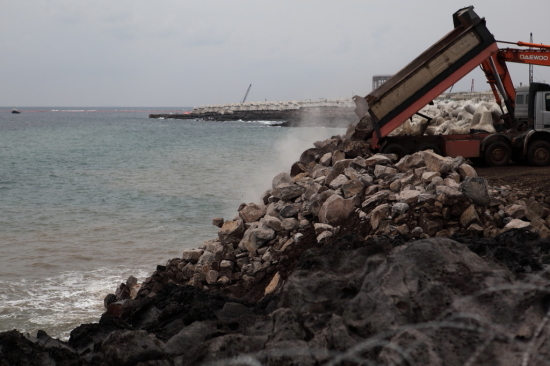 Photo by Cho Sung-Bong in his Ohmynews article, Nov. 13 / The illegal naval base construction (destruction) is destroying environment in thorough violation of the EIA and wasting people’s tax enormously. Regarding budget, while Presidential Candidate, Moon Jae-In (Democratic United Party) stated his position on Nov. 8 that the Party Opinion on the naval base project is to stop construction first then re-examination of the project. 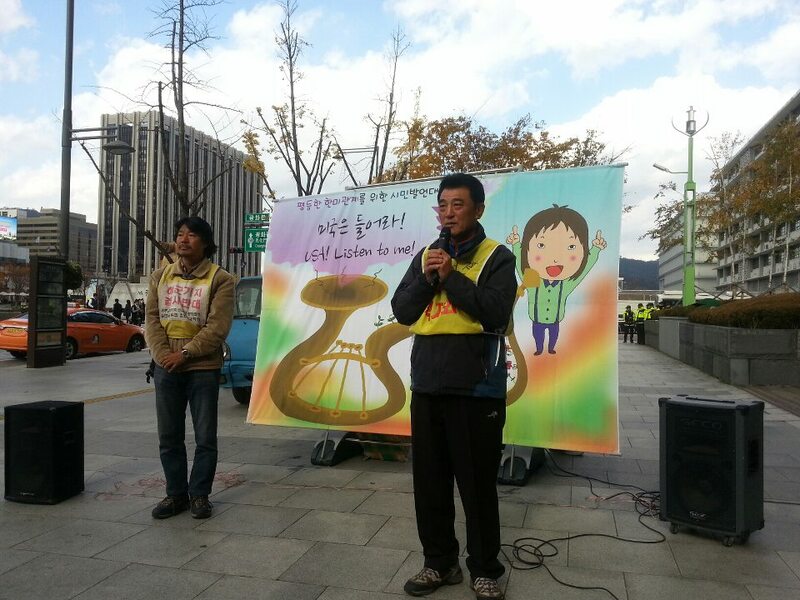 The Pan-Island committee has a plan to carry on one-man protest to demand the ‘whole budget cut,’ in front of the Jeju branch of the Democratic United party, Jeju City from the morning of Nov. 14. People here are mobilizing themselves to send protest messages to the facebooks and tweets of the members of the National Assembly. # The Jeju based or origin National Assembly men/women (All are Democratic United Party members) are making their best efforts to cut the budget. Please encourage and support them to put more pressure to their party colleagues. Thanks Abigail for providing above facebook information. 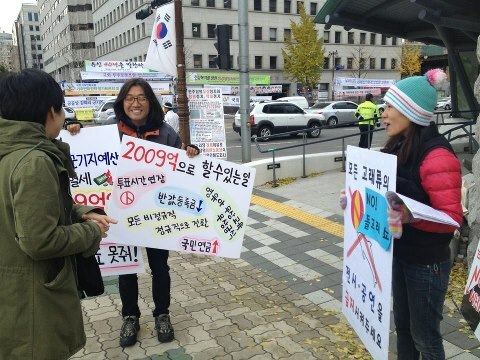 Photo by Kang Ho-Jin, Nov. 13/Peace activists are holding one-man protest in front of the National Assembly to cut the budgets on the naval base project. With 200 billion own, there are so many things that you can do for people’s welfare: Free meals and education for children, tuition support for students, irregular workers’ position change to regular workers etc. Photo by Cho Sung-Bong in his Ohmynews article, Nov. 13 /People are desperate to stop 24 hour construction(destruction) that started on Oct. 25. The photo is on Oct. 26 when people are desperate to stop construction vehicles in front of the main gates of the construction site.